As the Thanksgiving holiday approaches many of you are wondering if you can give your dog turkey ...Yes, you can! The American Society for the Prevention of Cruelty to Animals (ASPCA) says, offering your dog a small piece of boneless, thoroughly cooked turkey, plain mashed potatoes and a smidge of pumpkin pie are not likely to be harmful treats for your dog. Just be sure to avoid giving foods with large amounts of onion or garlic, or any treats sweetened with xylitol, a sweetener that can lower the blood sugar of dogs. When placing the meat in your dog's bowl, be sure to remove all pieces of bone, and the skin! Just like chicken bones, turkey bones splinter and can cause blockage or perforation of the intestine. Rich, fatty foods such as turkey skin and dark turkey meat are difficult to digest and can cause vomiting and diarrhea in your dog, and in extreme cases, pancreatitis. Dogs and turkey bones aren't a good combination. If you plan on serving Thanksgiving dinner in your home, it’s probably a good idea to give your dog a special chew toy and put him in a secure room. With so many people coming into and out of your house, your dog may become agitated. Dogs don’t like changes in their routine and may not find mingling with strangers to be enjoyable. There’s also a higher risk of your dog escaping to the outside when there’s so much confusion. 1. Try to keep all foods pushed toward the back of the counter, prepared and uncooked. 2. Feed your dog in their dog bowl. 3. Keep trash cans either secured with a tight fitting lid, or under a cabinet. 4. Caution your guest on arrival about giving turkey and other table foods to your dog. 5. Once the meal is over, place turkey bones in the garbage and remove the garbage bag from the room. It should immediately be placed in a garbage bin where it can't be accessed by your dog. 6. If you have guests coming into the home around the holidays this poses many dangers to pets. A child who does not know how to properly interact with your dog may end up the victim of a dog bite incident. 7. 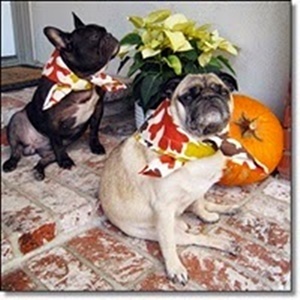 As guests enter and exit your home for Thanksgiving dinner this provides an opportunity for your dog to escape. 8. If you think someone gave your dog too much turkey or table food, contact your vet immediately. The same is true if your dog got into the trash and ate something he shouldn't have. Since most vet offices are closed on holidays including Thanksgiving, you should have an emergency contact number on hand. Most likely, this will be the nearest Pet Emergency Center. Happy Thanksgiving from The Pet Tree House! FOLLOW US!